Recently, I was asked about why I make all this fuss about teaching technical professionals to sell. Don’t you have enough to do being engineers, project managers and technical experts? The answer is two-fold: YES! You do have enough to do. And NO! You aren’t doing enough with what you are tasked to do. Samir Penkar interviewed me for his Future of Project Management blog post. I encourage you to read the full transcript of the interview which also includes the audio download of our discussion, as well. For those of you reading my blog post while you drink your first cup of coffee this morning, settle in and enjoy the condensed version. Here are 5 key take-aways about why Project Managers have to be more than project managers in today’s globally competitive economy. Project managers are at the cross-roads of customer conversations as well as a lot of other actionable items. Project managers are more than throughput-specialists. The status quo perception of a project manager equates you with a traffic manager. You’re viewed as being responsible for overseeing the input-throughput-output of a project, over the scope and cost of that project, while providing a quality deliverable. That’s a lot of work. It also puts you in a unique position to identify opportunities for future business development. Develop the radar that allows you to pick up on these verbal cues in the customer conversations you are already privileged to have. You are in an enviable position. Project managers should think horizontally rather than vertically. OK, this is an Olympic year so let’s give it a go. Think the 4 x 100 m relay race. Each team member runs a specific leg of the race because they specialize in what’s needed for that particular leg of the race. Their role isn’t over once they hand the baton to the next person. When you run the race, the energy and input-throughput-output is horizontal. That’s what’s needed for today’s business development. Someone handed the first racer that baton so the race could begin. Develop an understanding of where your work / input comes from. Meet the folks responsible for developing business for your company and treat them like the customers you manage each day. Your internal colleagues are also your customers and you are all part of the revenue relay team for your company. Although your organization may be organized vertically, think across those silos. Races are run horizontally. Project managers need to have customer conversations that not only appease the customer during the project, but develop future business as well. Project management is not a glorified form of customer service. Yet within vertically organized, status quo corporate infrastructures, this often is the role that PMs end up playing. It’s a balancing act trying to manage customer expectations while plugging in new requests, rework, and change orders into project management software. Somewhere in this equation is potential business built on trust and leveraging your position as a resource to the customer. You can’t build trust if you are at the mercy of a software timeline and corporate profitability mandates. Otherwise, your customers start to feel like they are working for you and your company– and your project management software – rather than vice versa. Your becoming a trusted resource and advisor for your clients is built on more than being on time, under budget and as specified. Project managers can learn to think on both sides of the table from a business development perspective. Put yourself in your customers’ shoes. In order to do this you need to do some homework about your customer as well as the industry and economic trends impacting the world in which they live. Think What’s In It For Them. Thinking beyond the proverbial box, or scope, of your current project involvement or company’s agendas allows you to make suggestions for the future. You’ll end up differentiating yourself to your customers, and moving beyond their stereotyping you as a traffic-directing project manager. Everyone in your organization is responsible for business development, whether it’s in your job description or not. Project managers usually are natural leaders. You are in a unique position to lead your team by example. Encourage and educate team members on how to pick up on customer conversations that can grow not only your company’s revenue, but that of your clients’ as well. 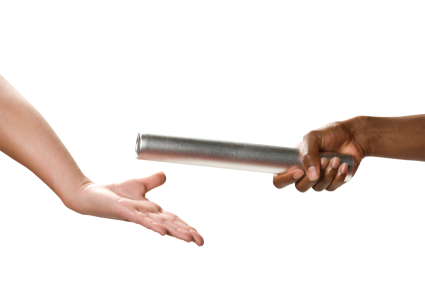 While your team may not be able to carry that baton for the full leg of the race, they can record these business opportunities and you can collectively discuss at team meetings. Make them comfortable and knowledgeable about each other’s roles in the race. Carry the energy horizontally, beyond the close of the project. Where does your output go after you hand it off? And after that output becomes some other department’s input, where does it go from there? It’s a longer revenue relay race than you think. That way, you take everyone to the finish line. Together. Now that’s project management. And leadership.